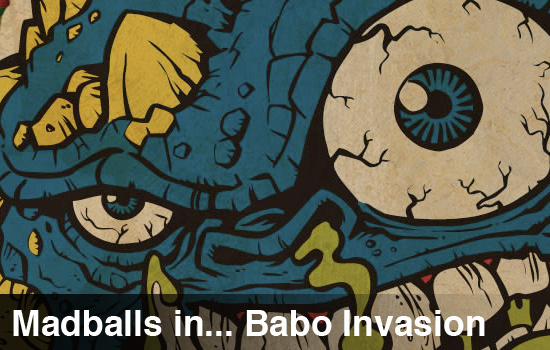 Madballs in...Babo: Invasion can best be described as Smash TV meets Serious Sam with sprinkles of class based combat from an MMO. All of this was created by mashing characters from Babo Violent, and a bizarre toy from many of our own childhoods - Madballs. These wild and crazy balls were a bit like Nerf toys that fell out of the ugly tree, and landed in the womb of some pretty twisted monsters; skulls, eyeballs, horns, scars, and wounds were not uncommon in these ghastly humorous balls. The boys at PlayBrains decided to strap a gun to their balls and away we go into the Invasion. Believe it or not PlayBrains has crafted a narrative for a game about balls, the story follows two factions; The Evil Scorched faction, and the Good BDI faction. Each faction has dynamic differences in their gameplay and characters, adding a level of depth we didn't expect to see in a title like this. You can play either faction from the start, and various unlocks occur by playing through each campaign. 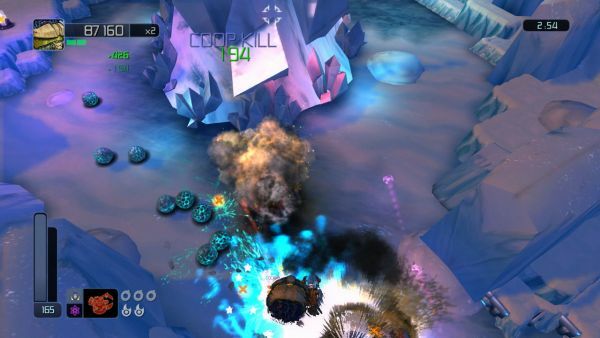 The gameplay itself is a balance of hectic shooting and pseudo-puzzles. It's highly recommended that you take your time through Madballs. You'll sell yourself short if you don't at least keep an eye out for some of the many secret areas in the game. Particularly in the Snow Blind level, there were many caves worth exploring, and many secret enemies to encounter. The game is sure to punish you for getting ahead of yourself with staggered health and weapons throughout the levels. Until, of course, you've unlocked your own means of healing. Speaking of getting ahead, a nice feature in co-op is the teleport to leader functionality. If one players gets too far ahead and another is lost, the game will teleport the group back together and they can continue rolling on their merry way. Madballs has an incredible amount of unlocks for an arcade title. You'll be unlocking new characters, weapons, and player upgrades in no time, with progress towards other unlocks available for viewing from the menu. All unlocks are just a matter of playing the game! More balls than you can shake a stick at. Co-op in Madballs adds a level of depth to the game that's similar to squad based shooters. There are elements borrowed from games like City of Heroes, where you have a tank character go alert as many enemies as possible and have them follow that character into a co-op ambush. There are support classes that earn the ability to heal. There are classes built for speed, for attacking and for turning into a giant ball of rock and fire and crushing everything in its path. Each class and character has unique abilities, and if you have four unique players the team can be very self-sufficient. It's always disappointing to find a co-op game that doesn't increase difficulty when more players are introduced to the mix. Thankfully Madballs scales pretty well, every time a new player enters the fray, the enemies scale in difficulty so the challenge is always there. This makes playing on "easy" mode, not-so-easy, but still enjoyable! Exploration is recommended especially in co-op mode, but don't get too separated since re-locating your allies is a bit of a chore.